So you want to find the best black lipstick. Yes, you could wait until October 15th and get the cheap crap they sell at Walgreen's. Why? It won't look too good and, as time goes by, it'll just look worse and worse. Still––does anyone sell high-quality black lipstick? If it's designer, can I afford it without taking out a second mortgage? And what about black lipgloss? The answers to these questions are: yes; yes, unless you live in a cardboard box; yes. Here is our list of the best black lipsticks, and black lipglosses, on the market in 2010. Cons: Shiny; many goths prefer a matte look. The cheapest, and some say the best, black lipstick on the market. Nyx's high quality cosmetics deserve their reputation. This is the same price as a Walgreen's Halloween black lipstick, but the formula is longer-lasting and non-drying, unlike the generic Walgreen's tubes. This UK brand is, in the words of Gothique, "not quite MAC, not quite Wet'n'Wild." Cheap but well-made, Stargazer features many unique and inventive shades, from black to white to blue to bright orange. If you're looking for it in the US, I would suggest browsing eBay; plenty of resellers will ship internationally. Manic Panic also has "off-black" lipstick colors, including lethal black and black rose burgundy . 4. MAC's "Black Knight" and "Midnight Media Mattene"
MAC Cosmetics are justly famous for their high quality. 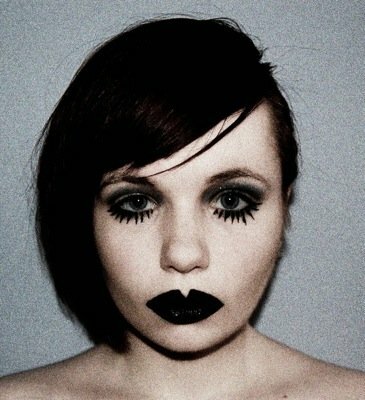 MAC's limited edition "MAC Style Black" took the black lipstick trend––huge in fall 2009––and made it explode. Lipstick Queen's "Black Tie Optional" lipstick, on its own, is a subtle grey with a darker undertone. With Lipstick Queen's Black Shine ($22) and you can have extremely glossy lips. Even with shipping, this lipstick is about as expensive as other items on this list. It's a black with a red undertone, leading to a deep purple, or "bruised violet," color. Looks dynamite on people with yellow-undertoned skin, such as blondes and asians. Illamasqua is justly famous for its long-lasting lipsticks, which come in a variety of fun and funky colors, from metallic glitter to deep purple. Of the lipsticks I tried, this was by far the best. Unless you're going to give it to charity, few $20 bills are better spent than on this lipstick. This is the product that started it all. 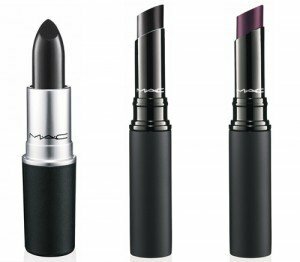 Lancome's black lipgloss, as well as MAC's black lipstick, both heralded the resurgence in interest in black lipstick as a trend. Above photo by Amy Clarke. This article owes a debt of gratitude to Temptalia's MAC Style Black reviews, which inspired the article and provided essential information.